There are multiple organisational layers within ICOS to produce, manage, quality control and archive the scientific data produced. Marine observations: will provide the long-term oceanic measurements required to understand the present state and predict future behaviour of the global carbon cycle and climate-relevant gas emissions. A network of ships and fixed stations will be monitoring carbon exchange between the surface ocean and the atmosphere, acidification of oceans, surface temperature, salinity and other variables. The Central Analytical Laboratory (CAL) ensures the accuracy of observational data, thorough quality control and routine testing of air sampling material. It provides reference gases for calibration of in-situ measurements performed at the continuous monitoring stations. It also analyses air samples collected at the monitoring stations. CAL is hosted by Germany. 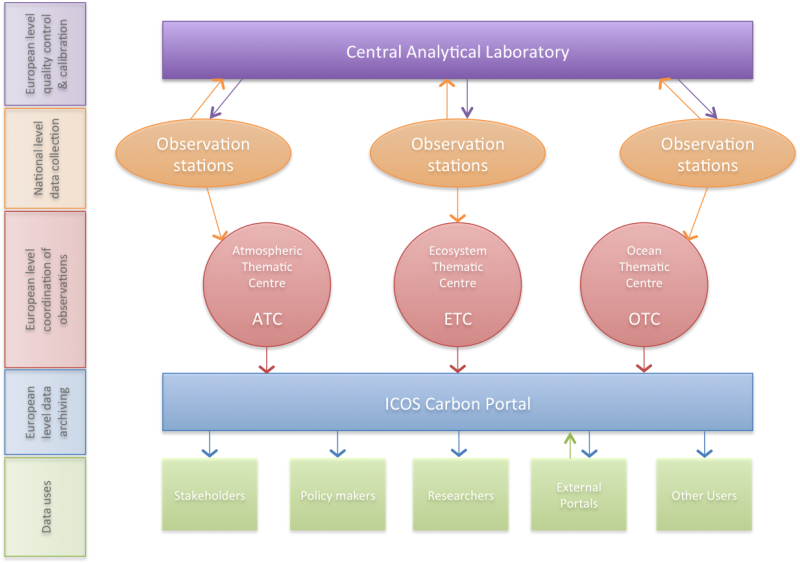 The Atmospheric, Ecosystem and Ocean Thematic Centres (ATC, ETC, OTC) coordinate, standardise protocols, and quality control data produced from national observation stations submitted to the ICOS RI. The ICOS Carbon Portal is a central data archive for all ICOS quality controlled data coordinated through the Thematic Centres. The ICOS Carbon Portal offers easy access to research data from ICOS scientists all over Europe, as well science and education products, including visualizations of and flux maps in time and space, and material for policy makers, educators and outreach. The CAL, ATC, ETC, OTC and the Carbon Portal are central ICOS facilities, available to all paying ICOS members.